Welcome to Serissa’s Sbooktacular Month Event! 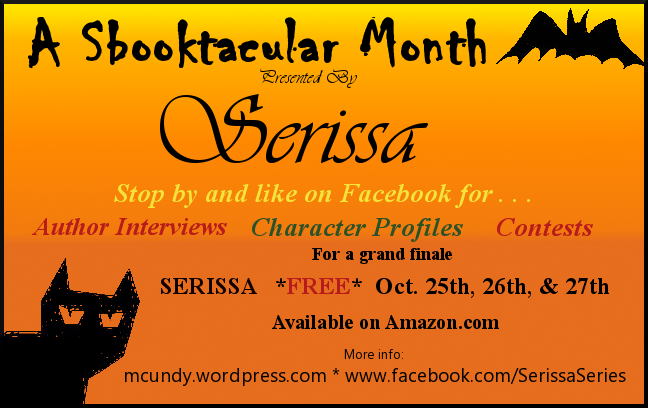 I will be introducing character profiles for Serissa throughout the month. I have been keeping track and profiling them when possible throughout writing the series, and will be pulling these from what I call the guide. It has numerous notes about the origin of the characters to the origin of the story. I may also pull up some other fun bits and pieces from quotes to trivia for those who have read the first book already. I am holding a contest for Amazon gift cards. I will be opening this up soon on Facebook, so be sure to go to the fan page and like for a chance to win! Contest will run throughout October! Goal is to get around a hundred or more additional likes this month! Please share this one with your friends. There may even be a surprise event here or there, and the grand finale … FREE download days on Oct 25th, 26th, & 27th!! So stay tuned, follow the blog, like the Facebook, and join us on Twitter to keep up to date on future events all month long! Feel free to post this and share, and as always if you’re an Amazon Prime member, you can borrow Serissa for free now! Just a Little E-book Marketing. Competing with thousands of e-books in the same genre is difficult, but I did. I came in #9 on the Top 100 Free downloaded books on Amazon a couple weeks ago. I advertised all over Facebook, Twitter, and a few websites. I intend to stretch that to other free promotion sites my next round, and then again to some paid ones the round after that. Trying different ideas as I go. So far I’m content with my free run. I had nearly 600 downloads in ONE day over five separate countries. I’m not entirely sure how successful that is, however, I have read many authors on their first free runs have that many downloaded over their five days stretch rather than in one day. If that’s the case I did something well. If not, I can only get better. Serissa – One Day FREE! I am running two promotions right now. One I did for Twitter last night, if I could hit 300 followers, I’d release Serissa for FREE for one day. We hit it by a landslide. 368! Good job guys, I appreciate all the help. Serissa will be free on 8/14! For one day only! The second promotion is for Likes on Facebook as well as Twitter, I’m going for 500 Likes/Followers each! All the help I can get in spreading the word. I will make Serissa free again for anyone who missed it the first time, and for any additional followers! That being said, if you can leave an honest review if you enjoy it. Reviews can be left at Amazon.com or Goodreads. Of course not necessary, but appreciated. Thanks for all the help, RT’s, shares, and likes! Here is the review I received from a new site, A Tiger’s Tale Edits & Reviews. 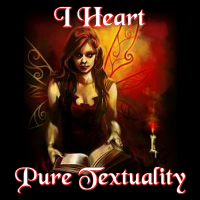 They are currently accepting submissions for book reviews, and even editing services. Thanks T! This is a book about a coming of age girl named Serissa, Sara for short, who has always been on the outside. Until suddenly her entire life is turned upside down. After Sara and her mom move from a small town to a big city she thinks her life may actually change for once. Four years later it has. She has two best friends and and a boyfriend, the first boy she hasn’t felt awkward around. Sara’s friends convince her to sing in the senior showcase and with her new boyfriend by her side she reluctantly agrees. Singing in front of people has always terrified her although she’s enjoyed singing quietly in the back of the choir for as long as she can remember. When Sara’s friends decide to follow a band around the country her world suddenly changes. She finds herself questioning everything she’s ever known, her friends, her boyfriend, and her childhood bully. Who can she trust? Who really has her best interest in mind? Over the summer, Serissa finds out what her life’s purpose is from the last person she ever expects and has to decide who she’s going to let help her achieve it. It is well written, the storyline is fresh, and the characters are likeable. Even the bad guys make you believe they’re good. This book is perfect for teenage girls who don’t feel like they fit in and can’t find their place in the world. It really makes you feel like you are living in her world and you will wonder what will happen next from each page. That’s just the description to see the whole thing please visit the site and check out their services. Great turn around time! Their Facebook Page. Need Likes, Follows, and Sharing? I need more likes, follows, and shares myself. 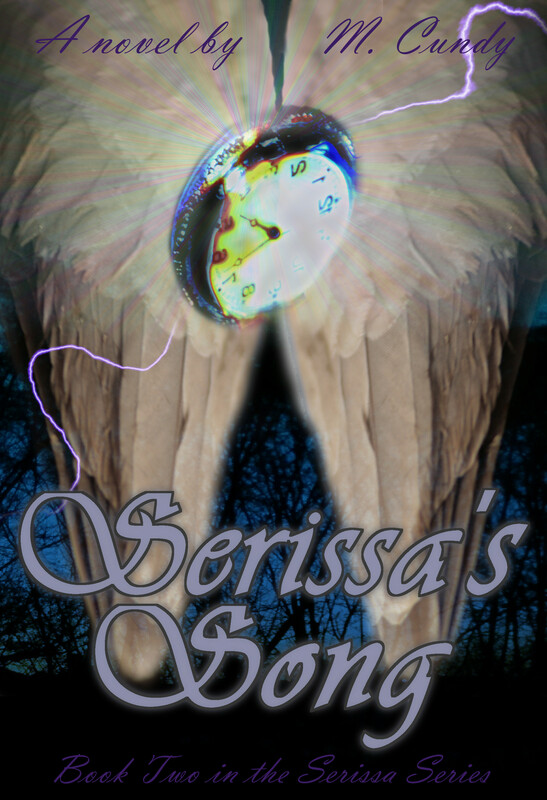 My numbers have grown quickly, but I need more in order to release my book Serissa for free. 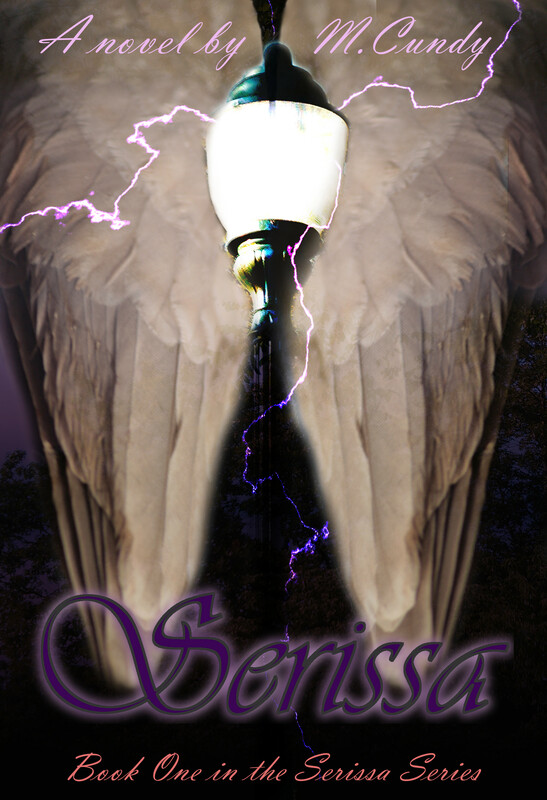 Serissa is a Young Adult, Romantic, Paranormal/Fantasy. You can read up on her here on the blog. She is the first in a series which so far has received only 5 Star Reviews! Twitter Follows– 184, I would like 250. Facebook Page– 53, I would like 150. Thank you for all the current support and help. I really appreciate it, and I hope to pay everyone back with a free download soon. If you can’t wait and are a Amazon Prime member you can borrow the book for free now!